Virgin Atlantic could spark a premium-class price war with a British Airways by slashing fares by up to 40 percent. In an attempt to maintain bookings as the downturn deepens, the London-based carrier is offering discounts to all 30 of its worldwide destinations. Prices include a return to New York dropping by 40 percent, Johanessburg 37 percent, Miami 34 percent, St Lucia 34 percent and Cape Town 34 percent.The reductions come as airlines across the industry struggle to fill their premium seats, as businesses cut back on travel expenditure. On Wednesday BA reported a 12.1 percent slump premium passengers in December, compared with the same month in 2007. Virgin is hoping that its price cut will encourage tourists and executives from small and medium-sized companies to upgrade. Most carriers have reduced economy fares but have been more reluctant to cut premium rates. BA has been particularly insistent that it will not drop business-class fares because it wants to maintain the yield, or revenue. 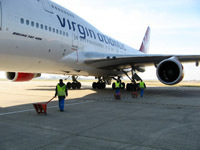 However, Virgin’s price decisions will almost certainly force BA to respond. Premium travellers are more resilient to price increases than economy, but the financial crisis is resulting in the airlines’ most profitable customer base deserting. BA has said that demand from banking industry passengers fell drastically in the weeks after the collapse of Lehman Brothers last year. Virgin, which does not give detailed passenger numbers, is also thought to have been badly hit.